So what’s most important in a card game? The advantage you generate? The damage you put out? A strong defense or an overwhelming offense? It’s a lot of questions to consider when even looking at a card. …I’m not saying Oranguru is a crazy powerhouse, he’s actually a support card. Oranguru is a Colorless Basic Pokemon, 120 HP, with a Fighting Weakness, no Resistance, and a Retreat Cost of 2. His first attack is Resource Management, which for 1 Energy cycles three cards back from your discard pile to the bottom of your deck. His second attack, Profound Knowledge, doesn’t sound like an attack at all but a pondering moment that confuses you as to why a 3-for-60 attack would be remotely considered good, thus why it is able to Confuse the opposing Pokemon. So why would either of these be good? Short answer, Profound Knowledge wouldn’t, but Resource Management can be, especially with Looker who we’ll take a look at tomorrow. For now, getting the ability to have three cards get reused is a good thing, and if you can stipulate the cost of them being at the bottom of your deck, you can get a lot of good usage out of it. Sure, it costs the attack for the turn, but imagine getting back three cards you used already again! …there’s ups and downs, so it’s good to know Oranguru can work well with things like Looker. Arora Notealus: Oranguru, also known as the Sage Pokemon…really should have just been the Guru Pokemon. I mean, I know technically “sage” and “guru” are similar, and that Oransaaaaaaage would have made no sense, but still. Ya know…details. Side Review: Gastrodon – see now, Gastrodon has a 2-for-30 move that also Confuses, just like Profound Knowledge, but like, that’s more reasonable? It helps that he’s a Fighting-Type and can follow it up with Earthquake, which is objectively better than Oranguru. And it STILL doesn’t see play, since there are just better options overall. At least Oranguru has the benefit of a non-attacking…attack to work with. Next Time: I already said it was Looker, no need to whistle me down. Oranguru (SM Ultra Prism) is very much like Yancy (Sylveon GX SM Guardians Rising), fetching you three cards of any kind. However, Oranguru might be just a bit better than her. While Magical Ribbon fetches three cards from your deck to your hand, Resource Management fetches three cards from the discard into the bottom of your deck. Not only you get cards back from the discard, unlike Yancy, but it can be drawn from using Looker next turn, which we’ll look at tomorrow. Getting cards back is nice, and even though the strategy (Resource Management + Looker) may fall prey to N or Red Card (examples of shuffling your deck), you’ll eventually get one of your cards back to your hand. My next concern would be keeping Oranguru alive to continue doing its job. 120 HP, and maybe Fighting Fury Belt, can only take you so far, but Evoshock Raichu (SM Burning Shadows) can stall your opponent’s Active Pokemon for one turn unless switching tactics are used. 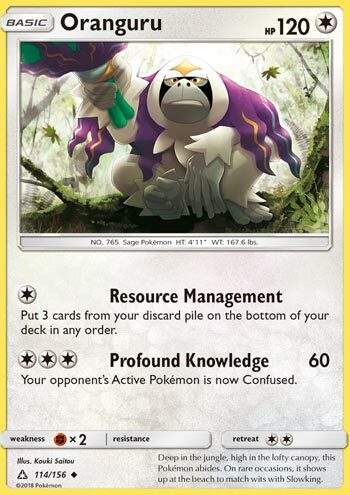 Or you can use Oranguru’s second attack called Profound Knowledge, which costs CCC for 60 damage while confusing your opponent’s Defending Pokemon. Although confusion is unreliable, you can still get lucky and get another turn without being injured. Overall, we have another flexible searcher which gives only one prize, unlike Sylveon-GX. Expect this card to be used in disruption decks! Notes: Almost tempted to dismissed this card, 21times, well his article, convinced me that Oranguru has shown creativity on how it’s been used. I can imagine facing a Oranguru deck and get frustrated due to losing resources and spending too much time on one match, even in a casual setting. Oranguru (UP 114) got a new version in the Ultra Prism expansion set. This Oranguru will see play mostly for its single Colorless attack Resource Management which allows you to put three cards from your discard pile on the bottom of your deck. And how is that significant, you ask? What good does it do to put three cards on the bottom of your deck? That’s where the new Supporter Looker (UP 152) comes into play. Looker lets you draw those specific three cards from the bottom of your deck. I first saw this in a video well before UP came out by Omnipoke. He didn’t provide a decklist, but he outlined how these three cards could combine to make a very disruptive stall deck. Giving credit where credit is due, MarquisEXB put together a list here that I built on here. This might just be the nasiest, ugliest, meanest, most frutrating lock down make your opponent mad at you deck out there right now. It’s worth playing just because it is so different – it will force your brain to work in ways that it doesn’t necessarily want to. It’s a good mental workout. Plus, it forces you to work precisely and efficiently. The biggest thing to realize is that once you get the Looker / Devolution Spray / Evoshock cycle going, it takes like thirty or forty seconds to execute the full cycle on PTCGO. I have had a couple of games where I simply ran out of time. My inefficiency in time management simply prevented me from winning the game. These matches can take a long time – I had a couple that went more than forty minutes. But it’s a REALLY good stall deck, and I’d highly recommend you give it a try. It will take you a couple of times to figure it out, though, so don’t be surprised if you stumble a little bit in your first couple of games. Hopefully, the notes I’ve provided will give you a decent guide and help you get up to speed with this very frustrating archetype. Oranguru hasn’t seen much play, but it’s very good in this archetype. In hindsight, we probably should have combined it with tomorrow’s review, but separating them gives me a chance to show off a different type of deck that might be able to abuse the Looker Oranguru combo with another Item that has quietly become one of the defining cards of our meta. Vince, if you thought today’s combo was good, just wait until you see Wednesday’s!